Easter Island is one of those iconic places you grow up seeing on the National Geographic Channel – the most isolated inhabited place on Earth and home of the remarkable Maoi heads. As part of our 2017 Gap Year travels we decided to spend four days on the Island in May, exploring and blogging. We’d done very little research prior to arrival, something we instantly regretted and as such we wanted to share our top tips for making the most of your visit to this magical island. Despite being 3,500km from South America, in the middle of the Pacific Ocean, Easter Island is part of Chile, and as as such the easiest and most frequent route is a domestic flight from Santiago. Which airlines fly to Easter Island? Currently LAN has daily flights from Santiago to Easter Island, while there is usually one flight a week from Tahiti. Prices per vary at different times of the year but flights booked via Spanish and local Chilean agents are often significantly cheaper than those used by foreigners. When is the best time of year to visit Easter Island? Autumn temperatures are around 22-25c during the daytime and 15-18c at night – with May being the wettest month of the year. During autumn sunrise is as late as 8.40am and sunset from around 7.40pm. What is the best way to travel around on Easter Island? As a word of warning, local and online maps of the island are often not to scale, they don’t differentiate between paved and dirt roads and also don’t give an accurate indication of gradient. This means distances are very deceptive, especially when you’re travelling to Tongariki in the dark to arrive for sunrise and when you factor in the road condition and large numbers of wild horses on the roads. There are plenty of car hire shops along the high street, starting from $50 per day. Mountain bikes from $10 per day. 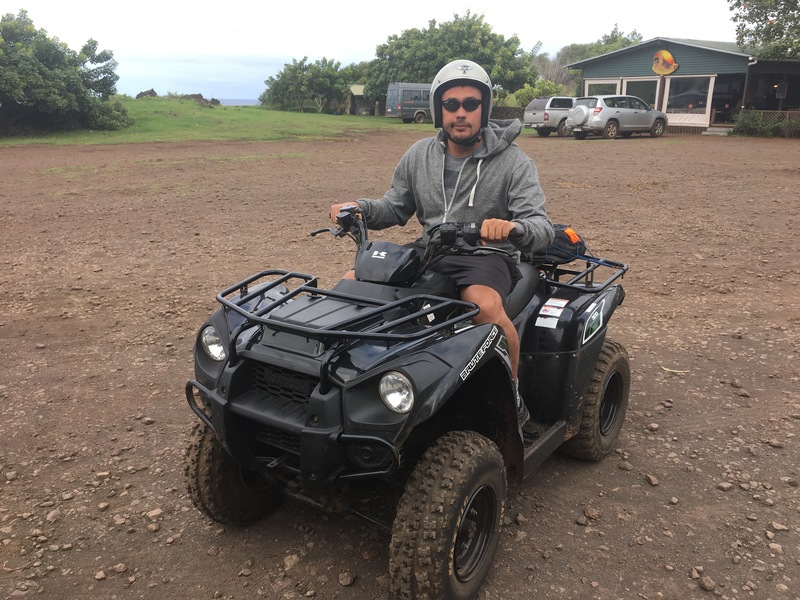 While many travellers opt for a mountain bike, we decided to go for a quad bike, which cost $135 for 3 days and we used about 3/4 of a tank of petrol which we had to refuel before we returned it, which cost a further $15. Remember also that cars are left hand drive which is even pertinent when there are no signs or road markings. There are no real speed limits although 30km/ph seemed normal in town and 40-60km on main roads. Is there a fee or tax to see the Maoi on Easter Island? Entry to the main Maoi sites requires a National Parks entry ticket which can be purchased at the airport on arrival. The ticket costs USD $80 for foreigners and $20 for Chileans, which can be paid in dollars or peso) and is valid for one single entry into each Maoi site over a ten day period. Tickets are stamped or marked by a park officer on entry to each site. If you exit the site and wish to revisit it later in your stay you’ll have to purchase a whole new ticket. There are no other arrival or departure fees or taxes payable. What are the Maoi site opening times? During autumn/ winter, the main Maoi sites are opening between 8am and 6pm when a park officer is on duty. Most sites are visible from the publically accessible road and in most sites there is little stopping entry after hours. The road network is very limited so you usually will find a single entry point and a guard hut where your pass is stamped. Where are the Heads on Easter Island? The Easter Island heads, known as Maoi are located in a number of archaeological sites around the island, as such it is advised that you plan your days activities and transport to ensure you can see everything you want to. It is important to note that local and online maps of Easter Island are neither to scale nor an accurate representation of what you will see. Icons used on most maps use the Maoi head icon to simply indicate an archaeological site, which can be anything from a cave to a head – not all are Maoi and some Maoi are far more impressive than others. What time of day should I visit the Maoi? It’s important to plan your visit, not only to ensure you fit everything in but also to take advantage of sunset and sunrise in the best locations. As a rule of thumb, the Maoi on the west coast are best viewed at sunset, while the site at Tongariki is famed for its sunrise. Where can I find tourist information and facilities? The main tourist information centre is located in the centre of town, although it contained limited useful information and the advisor didn’t speak English. There are two main ATMs, both near the main marina with the Santander branch being easiest to locate just next to the Haka Honu restaurant. The Chilean peso is the main currency on the island, although some locations may accept US dollars. Car rental shops usually accept credit cards but bars and restaurants usually do not. Best places to eat and stay? 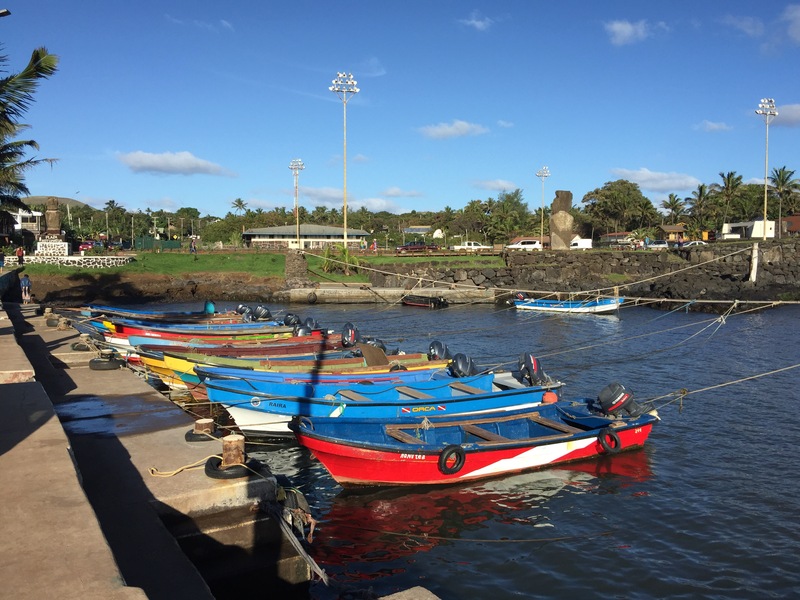 The main town, Hanga Roa, has countless hotels to suite every budget and is just a short walk from the high street for car hire and restaurants. Around the marina area are bars and restaurants, shops and scuba diving centres.